Select Option 28578 - 8 Fr. 28580 - 10 Fr. 28582 - 12 Fr. 28584 - 14 Fr. The perfect discreet, portable catheter for active women! 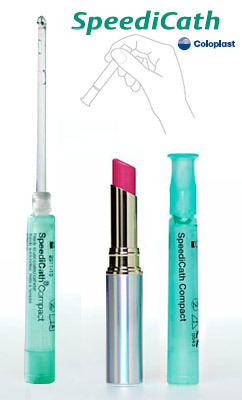 SpeediCath Compact from Coloplast is a single-use, sterile and pre-lubed catheter packaged no larger than a small lipstick container. With an ultra-smooth surface and polished eyelets, there is no more discreet or comfortable catheter for quick use; simply twist the package open, use the catheter, place it back in the tube and discard. Discreet: Small packaging looks similar to a lipstick container - making SpeediCath the perfect travel companion. Clean: Sterile and pre-lubricated with a non-touch grip for safe insertion. Safe: Ultra smooth surface and coated eyelets protect the urethra and bladder wall. 100% PVC Construction free of DEHP or other Phthalates. Designed for Women: At 2.75 in., SpeediCath Compact is the perfect length for insertion in female urinary tracts. Clinical studies show that Speedicath is at least as effective as other intermittent catheters. Fast: Already lubed and hydrated, the SpeediCath is ready for insertion as fast as you can twist the top. Size: Comes from 10 - 14 Fr. and cath tube measures 2.75 in. everything is great about this product. it makes my life so much easier. I love how this product fits in my pocket so that when I use the bathroom at work, no one knows I'm carrying it. After having a hysterectomy and bladder sling surgery 3 months ago I had complications with urinary retention. I went from having an in dwelling Foley catheter for the first week I was home, to having to self cath several times a day with a red rubber straight cath. I would have to wash a reuse the red rubber cath each time, which made using public bathrooms out of the question. It was really embarrassing. One of my dear friend saw these on a tv commercial and told me about them. I ordered them and use the when I am in public. They store easily in my purse, they are sterile one time use, so I can toss into the trash and no one knows what I am using. They are much more comfortable and easy to use than my red rubber cath. I am a health care worker in an operating room and I have seen various types of catheters. I would highly recommend this product to others. I have a neurogenic bladder from a spinal pain injection mishap. Spent 4 days in the hospital paralyzed from the waist down. The bladder never improved over a year later. I am not able to empty my bladder completely so I cath twice a day as recommended by my urologist. This is a great product and eliminates the whole lube mess and having to carry around a bunch of stuff. Great to use at home or on the go . Makes it much easier for me to get out of the house . the need for the catheter is random and one never knows when it will be needed. Having the discreet compact all in one (catheter,lubricant) catheter in a pocket or purse conveys a feeling of confidence and the ease of use and disposal is also a plus. I am very happy I tried this product and now it is all I use. It fits in my pocket comfortably. I highly recommend this product. The Speedicath Compact catheters are impressively designed for compact and easy cathing. Drop your purse and its contents spill out on the floor? Nobody would even notice them apart from any usual accessory. To use, you simply twist and pull the cap off (careful to hold it upright or you may get some lubricant on your hands), insert the catheter, remove & place it back into the container. Once finished, simply discard the whole package. For the regular catheter user, these may be a little pricey to rely on alone. However, if you travel frequently or on the go, you probably prefer a fast and convenient way to cath, so it's worth keeping several of these handy for situations where you either don't have access to more supplies or don't want to carry them. I have to use every day and this product makes it so easy to go. The liquid in tube works well as extra lubricant.